To be notified of court hearings. To be present at court proceedings. To be informed if the defendant is released. To have recovered property returned. To be provided a secure waiting area for court. To be informed of assistance available. To receive restitution when possible. To appear at sentencing and make a statement. To be informed of the disposition of the case. Click on: Litigant Name Search. Search for cases in the: 26th Judicial Circuit. Type in: suspect’s last name and first name. If the defendant is placed on probation, the court may order the defendant to make restitution to pay for the cost of your injuries, damages, or loss. Restitution cannot be ordered until the case is finalized, so it may take several months or even years before you are paid in full for the loss. If restitution is ordered by the court, this office will make every effort to see that it is paid. If you have medical expenses, funeral expenses, counseling expenses, and/or lost wages due to this crime, you may be eligible to receive money from the Crime Victims’ Compensation Fund. This fund does not cover any stolen items, damaged property, pain and suffering, or anything that was covered by insurance. The claim must be filed within two years of the date of the crime. To receive additional information regarding this fund contact the Prosecutor’s Office at (573) 346-3910 or call the Crime Victims’ Compensation Office directly at (800) 347-6881. Bail is money or property promised to the court as security when the defendant is released with the agreement he will return to court. The court sets the bail amount based on the nature and circumstances of the crime, if the person poses a danger, criminal records, and the likelihood that the person will attempt to flee. Bail can be forfeited if a defendant fails to appear in court. 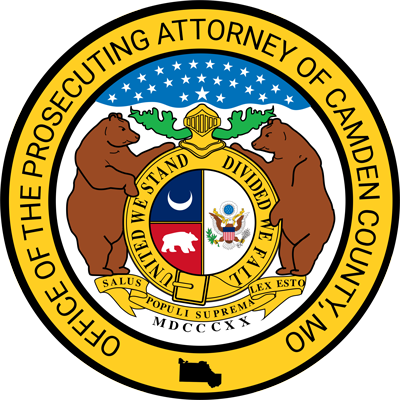 If a person is arrested for a crime in Camden County, they will be held in the Camden County Jail. As the victim, you can request to be notified by the Sheriff’s Department of their release. The Sheriff’s Department can be reached at (573)346-2243. Be prepared to call 911. Carry a cell phone with you. Check with your phone service provider to see the best way to call for emergency assistance. Set up speed dial for emergency phone numbers. Teach your children how to call in case of an emergency & what information needs to be given to the operator. Tell someone. If you feel threatened by anyone, tell a trusted friend, family member, employer, co-worker, child’s caregiver, or healthcare provider. Give this person details as to why you feel threatened. Devise a code word with this person, to call the police. Work with a neighbor & develop signals that when used, they know to call the police. Know where you will go. Have a room in your house with a strong lock. Stay away from rooms that have no exit doors and away from areas, like kitchens, where weapons are accessible. Have a plan on where you will go or who you will contact in case of an emergency (shelter, motel, friend, family or police station.) If you are being followed drive to a police station, hospital, fire station, or a drive-thru restaurant. Keep copies of all important paperwork. Keep copies in a safe, easily accessible location or give to a person you trust. This should include identification for you & your children, insurance information, and extra keys. Keep a set of keys in a safe place that you can get to quickly. Keep a suitcase/bag packed. Hide it or keep it with a friend. Install new or extra locks. The locks on your doors should be changed if you feel threatened by someone who had a key. Install metal doors to replace wooden doors. Add additional locks to doors and windows. Have a security system installed. Add motion detectors inside & outside. Add more outside lights. Screen your phone calls. Let the answering machine/voicemail pick up. Have a co-worker screen your calls without admitting if you are there or not. Record the calls from the person you feel threatened by. Ask people you trust to walk you to your car. Stay within a group and in a well-lit area. Constantly be aware of your surroundings. If you are walking alone, talk to someone on your cell phone or pretend to be speaking with someone on your phone. Carry a keychain alarm & pepper spray. Take self-defense classes. Remember to yell “fire”. This will draw more attention than yelling for help. Think of other shocking statements, such as “naked man” or “ugly woman”. Pay attention. Stay away from poorly lit areas. Look around and under your car for people hiding or something that could damage your car. Always keep the doors locked & check the back seat. Keep records & documentation. Keep a journal of unusual activities including the date and time. Document everything you can think of about your encounters with the person that you are threatened by. If injured, take pictures as the bruises progress. Keep all medical records of injuries. How do I get an order of protection? Go to the courthouse to apply for a temporary protective order (aka exparte). The judge may give you a temporary order immediately. A hearing will be scheduled within 15 days. After the hearing the judge can grant a permanent order which lasts 180 days to one year and is renewable. This service is free of charge. Conveys the above through another person. *This type of conduct should be reported to law enforcement. Emotional anxiety – feeling fearful, guilty, and out of control. Extreme avoidance of anything associated with the event.